Pope Francis has rebuked those who kill in the name of God warning them that they commit a grave sacrilege. Noting that religious freedom cannot be guaranteed by legislation alone, the Pope urged his listeners to promote attitudes of respect and cooperation in the service of the common good. When a person is secure of his or her own beliefs, he said, there is no need to impose or put pressure on others. Pope Francis also referred to new challenges which must be faced “in a world that tends to economic and cultural globalisation”. Alongside the globalisation of the markets there must also be a corresponding globalisation of solidarity; together with economic growth there must be a greater respect for creation; alongside the rights of individuals, there must be the guaranteed rights of those who are a bridge between the individual and the state, the family”. 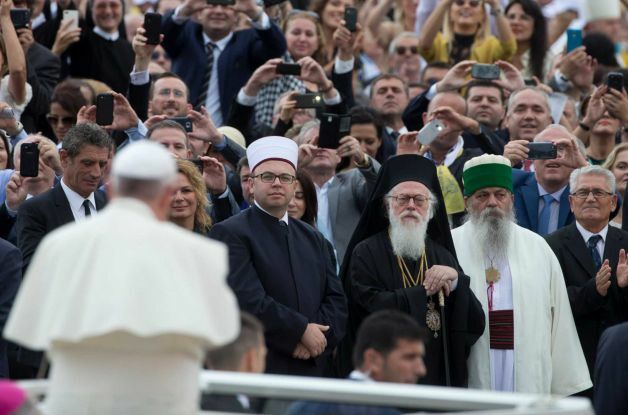 Separately, on Sunday, Pope Francis told Albania’s priests, religious and lay movements that despite their many difficulties, they must have the courage to go out and serve those most in need. Speaking at Vespers in Tirana’s Catholic cathedral, the Pope recalled those pastors who paid a huge price under the atheist regime, experiencing prison and persecution in order to remain faithful to Christ. When love for Christ is placed above all else, Pope Francis said, then we are able to move outside of ourselves, of our personal or communal pettiness, and move towards Jesus who, in our brothers and sisters, comes to us. His wounds are still visible today, the Pope said, on the bodies of so many men and women who are hungry and thirsty; who are humiliated; who are in hospital or prison. What people are looking for today, the Pope concluded, is not experts, but rather humble witnesses of the mercy and tenderness of God. At the close of his Sunday visit, Pope Francis visited a residential centre for disabled and needy children run by an Italian charity in the Albanian capital, Tirana. It was the final engagement of his one-day visit to Albania. In his address at the Bethany Centre the Pope spoke of how faith, working through charity, can dislodge indifference, disbelief and apathy. He also said goodness offers infinitely more than money which only disappoints and warned against measuring everything in terms of power and money.